->Factory pre-recorded Music 8 Track cartridges HERE! ->8 Track Head Cleaning Cartridges HERE! ->8 Track Blank Cartridges HERE! are generally stereo - 2 channels. Please do not confuse 8 Track Stereo with 8 Track multi channel studio recording tape decks , which commonly are also refered to as 8 Track, but are based on 8 channels. Home Stereo 8 Track players / recorders can only access 2 of the 8 tracks on a tape cartridge at one time, which plays one of four stereo programs. The remaining programs, are accessed by physically shifting the stereo play head up or down to allign with the other previously untouched tracks on the tape. 8 Track Players generally play at 3 3/4 IPS, which is double the speed than found on a standard cassette deck. This yields more space for the music on the tape and thus inspite of the less developed recording technology, (if comparing to a Hi-Fi stereo cassette deck or to a quality reel to reel deck), 8 Track players often amaze with their sound qualty. This I beleive is the main reason why 8 Track is still alive and a favored collectors item. Quadraphonic (= 4 chanel) 8 Track players use the same size and physical type of cartridge than a stereo 8 Track player, but have a play / record head that in addition ot stereo can access 4 Chanels at the time and thus 2 quardraphonic programs can be accessed on a "Q8" quadraphonic cartridge. are based on 1/4" tape and assembled in a tape loop to play the loop over and over continuously. 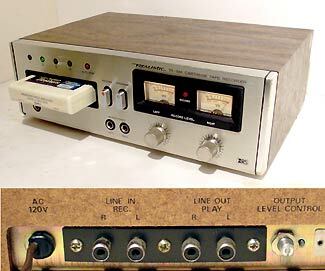 The 1/4" tape is segmented into 8 parallel tracks, which allows to provide 4 stereo programs. At the end of the tape loop is a piece of alluminum foil, which conducts electricity to tell the 8 track player through it's tape sensor, to advance play heads to the next program before the loop plays over. Detailled Features:  FRONT PANEL: (left to right, bottom to top): Tape counter (minutes/seconds), 1/4" (6.3 mm) 2 x Headphone jacks (Front/ Rear); Rear panel AC outlet power switch (Switched/Unswitched), Track indicator lamps (1,2,3, 4,) Stereo / quadraphonics indicator lamps, tape loading slot, Program Selector push button, Chanel Selector push button (2Ch/4Ch), Eject push button, Record push button, Fast Forward push button, Pause push button (ON/OFF), Selector rotation knob (Auto Eject: Each (1-4 + 1-2) / Continuos Play / Repeat; 4 VU Meters with each: Recording level control + 3.5 mm Mic input jack; REAR;  4 RCA jacks and one DIN jack for: FRONT, REAR AC power outlet, Power cable. Physical details: Unit quite heavy - Al l metal construction. Description: This rather rare 8 Track recorder/ Player is a heavy duty high quality deck made by Panasonic and is Technics branded. It plays / records either in quadraphonic or in stereo mode. It handles pretty much like a standard 8 track player or like a tape deck, except that the recording media are 8 track cartridges. Record your own 8 Track tapes either in stereo or quadraphonic (recording or play mode: 2 chanels (stereo) or Quadraphonic (4 chanels)! This unit provides line level RCA in and outputs (and 3.5 mm" microphone inputs). The unit was tested and basically works. Work performed: Not Refurbished Yet! - Allow 1-4 weeks for restoration - Deposit may be required. Possible work needed: Replace drive belts, de-grease and re-lubricate mechanicla parts, clean elements in the tape path, treat switches, contacts and controls with contact cleaner, perform alignmenrts. Lot: 1 Technics Model: RS-858DUS Quadraphonic 8 Track Cartridge 4 Chanel RECORDER/Player as described and shown above, 1 Factory recorded quadraphinic 8 Track tape made for Ford Motor corporation ( I will be glad to send higher resolution images.). Secure and Easy Payment through Paypal.  Low mileage heads: Will last! Detailled Features:  FRONT PANEL: (left to right, bottom to top): 4 Track indicatores, "auto Stop" indicator, Tape loading slot, Head phone jack, RECORD button, Program button, 2 x 1/4" Mic Input, 2 VU Meters With "Recording" Indicator" 2 Inpu tlevel controls; REAR;  4 RCA jacks: L,R Line Out, L,R IN, Output level control; Power chord. Physical details: Plastic Fornt panel with aluminum Inlay, Wood case, plastic feet. Description: This 8 Track recorder and player handles pretty much like a standard 8 track player or like a tape deck, except that the recording media are 8 track cartridges. 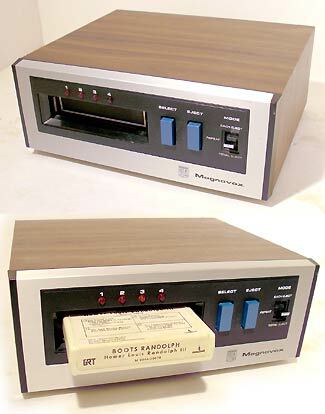 Record your own 8 Track tapes! This unit provides line level RCA in and outputs (and 1/4" microphone inputs). The unit fully works and ewas restored to be in fuly working consdition (see work performed below). Work performed: Cleaned, de-greased and re-lubircated mechanical parts and the motor. Replaced the drive belt. De-oxydized all controls, contacts and switches with quality contact cleaner. Full functional test: OK. Lot: 1 Realistic TR-884 8 Track Cartridge Recorder as described and shown above ( I will be glad to send higher resolution images.). OR: Quick Check Out Shopping cart button below will bill you about $230 total ($165 + about $65= Shipping DEPOSIT) Payment processed through PAYPAL. With Payment I will: pack, then calculate actual shipping cost to your ZIP code (within continental USA only! ), refund any shipping cost over payment, SHIP and e-mail tracking number. I reserve right to cancel order by refunding your entire payment. If need to approve shipping costs, before I ship, please use: Buy/Inquire instead. Please READ and agree to All details before proceding here. -Excellent condition - Low milage! -Repaired to Fully Working + Tested ! Description: This 8 Track player is probablyamong the best quality you can find. It is made in Japan with qualty parts. Mechanical parts are metal. This unit it is in excellent condition with little wear and almost new heads. It is very easy to operate and sounds great. 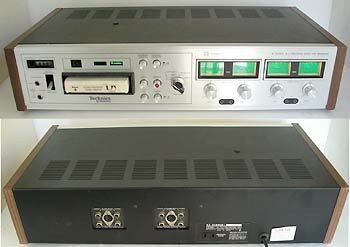 This unit provides line level RCA outputs. The unit works well and was restored to be in fuly and reliably working consdition (see work performed below). the unit has good heads with little wear that shoudl last. Work performed: Mechanical Overhaul based on a tear down. De-Greased and re-lubircated the capstan, Refurbished the capstan bearing. Replaced drive belt, lubricated motor and capstan shaft, Cleaned, de-greased and re-lubircated the track advance mechanism and other mechanical parts. Performed adjsutments. De-oxydized all controls, contacts and switches with quality contact cleaner. Full functional test: OK. Lot: Pansonic-RS-800As 8 Track Cartridge Player as described and shown above ( I will be glad to send higher resolution images.). OR: Quick Check Out Shopping cart button below will bill you about $220 total ($155 + about $65= Shipping DEPOSIT) Payment processed through PAYPAL. With Payment I will: pack, then calculate actual shipping cost to your ZIP code (within continental USA only! ), refund any shipping cost over payment, SHIP and e-mail tracking number. I reserve right to cancel order by refunding your entire payment. If need to approve shipping costs, before I ship, please use: Buy/Inquire instead. Please READ and agree to All details before proceding here. Description: Magnavox supplied quality equipment and this 8 Track player is no exception. It was made with high quality metal parts and is probably among the best quality you can find. Its motor is an AC synchronous motor, which is strong and built to last playing even difficult cartridge with power. This unit is in excellent and refurbished condition expected to last. It is very easy to operate and sounds great. This unit provides line level hard wired audio cables with RCA plugs. The unit works well and was restored to be in fuly and reliably working consdition (see work performed below). This unit 's head show soem wear but perform flawlessly. Thsi unit has a cartridge auto eject function: A switch lets one choose between eject after each track, eject after playing the entire cartridge, or repaeat endlessly. Pretty neat to have if wanting to store all 8 track cartridges to begin at the beginning. There is also a push button which allows to manualy eject the cartridge / stop the payer. Work performed: Mechanical Overhaul. De-Greased, cleaned and re-lubircated the capstan. Replaced drive belt, lubricated motor and capstan shaft, Lubircated the track advance mechanism and other mechanical parts. De-oxydized all switches and contacts with quality contact cleaner. Full functional test: OK. Lot: /Magnavox TD3502 8 Track Cartridge Player as described and shown above ( I will be glad to send higher resolution images.). OR: Quick Check Out Shopping cart button below will bill you about $185 total ($125 + about $60= Shipping DEPOSIT) Payment processed through PAYPAL. With Payment I will: pack, then calculate actual shipping cost to your ZIP code (within continental USA only! ), refund any shipping cost over payment, SHIP and e-mail tracking number. I reserve right to cancel order by refunding your entire payment. If need to approve shipping costs, before I ship, please use: Buy/Inquire instead. Please READ and agree to All details before proceding here. The DETAILS: A player such as an 8 Track player, Cassette Deck, Reel to Reel Tape Deck, Record Player or Turntable will serve as your playback device to feed it's analog audio signal into the input of your digital recording device, which will record the signal in digital format and store it as a digital sound file. Once in digital file format, the sound can be edited, processed and output in various different ways. In most cases your already exisitng home computer will provides all that will be needed to record, edit and output digital sound, files and media, but also enhanced sound input options are available, such as adding a high quality audio interface to your computer (I sell for $95 - includes software), or more sofisticated editing and compression software can be added to your computer for optimal results. In other words: The player will play your original media - The computer will serve as the digital recoding device and record your audio material digitally. Alternatively, if wanted, a stand alone digital recorder can be used instead of the computer, which records and creates digital sound files. These sound files can be in MP3format for direct play back on your MP3 player, or can be in a format of a higher resolution for further processing on the computer and for output to CD. Some of the folks who are coputer fobic prefer to use audio CD recorders as the digital recoding (and output device), but these are obsolte and hard to find in well working condition, as their laser assembly wears out with age. The Process of converting analog sound to digital: Connect the output of your source device to the input of your digital recording device. Likely an audio adapter cable will be needed, as computers often have different audio connectors than standard audio devices. In othe rwords: the audio signal coming form the 8 Track player (or what have you) is sent to the audio input of your computer via an audio cable. (Most computers have audio inputs via the sound card inputs, but you can also purchase a high quality audio interface for studio quality sound ( I sell an audio interface that connects via USB to your computer for $95. It offers also to connect a turntable directly via the interface to the computer to record your old record albums, and the audio interface comes with the software needed to record and edit your recordings). Once the hardware is all connected one will play the music on your player to use the computer or digital recoding device to record the incoming signal. It may improve the sound quality to insert an equalizer or similar device into the path of the audio signal, but sophphisticated software offers "post processing" of the digital signal in the computer as well. Once your music is digitally recorded: One will edit the recorded sound on the computer by cuting the sound of the entire tape / record, etc. into separate tracks, edit the beginning and endings, and name the resulting sound files so that they are properly displayed by MP3 players, etc.) When all tracks are separate one would convert the digital sound files to MP3 files, (which is to take up less memory space in the player), or one would output the sound files to audio CD with a CD burner / DVD burner. Conversion to MP3, or output to CD is done with software. Most computers come with software to convert sounds to MP3 and the hardware / software to record or burn audio CDs, but such software can also be downloaded form the Internet, for which in many cases the basic versions are free. 3 b) Your digital recording device: If not having a computer, or if wishing not to use it - you can purchase a stand alone digital recorder, which will be in the $200 to $250 range (recorder, plus memory card) - can provide. These recorders usually also have built-in microphones which means that they also con be used for othe rpurposes, for example to record sounds as well - Inquire .